Lovers, on the left we have Vince’s gorgeous Crop Sweater in Ivory; to the right, feast your eyes upon the glamour that is the GAP's Cable Knit Sweater in New Natural. Though it’s obvious that the fabulous GAP piece is slightly different in the sense that it features a more boatneck-esque neckline than the original; for just $44.99, in comparison to the $285.00 price tag of the Vince marvel, it is the perfect way to add a dash of cozy to your couture on the cheap wardrobe – at a price that is simply magical for the frugalista’s wallet! Thanks to Shopbop and GAP for the pictures. Oh E this is such and amazing find! 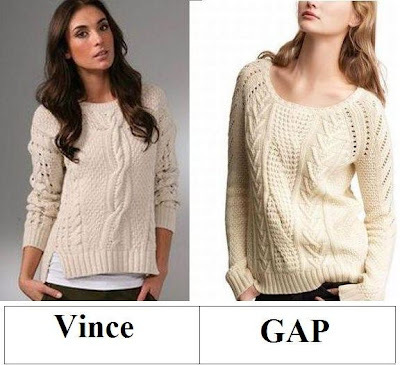 I actually like the Gap sweater more than the Vince because it doesn't have those side vents! Definitely the Gap version. I like that it's a little boxier than the Vince Crop Sweater and it's something I can either wear around the house or outside during the last few weeks of Winter. Hope you have a good Thursday, E.
I've always had great luck at THE GAP. I'll definitely go for the Vince. I like everything about it ... the fit, the lines, the cut, the style and color. Beautiful. Oooh, so girly! I love them both! Have a lovely day, doll! I'd go GAP. For sure. Great find! I love the color of the this sweater so much! And it's cropped too, even better! The Gap sweater is too cute! The Gap for me because the neckline would flatter allowing me to wear it better. Love them both! What a great creamy color. My sweaters from the Gap have kept for years. I love having them for winter. I like the sweater. I hope I could also have one like that since I'm really addicted to fashion, especially that I'm fond of collecting stuff like that. Love both, but for the price, the Gap one is perfect!! I love chunky knitted sweaters! Both of these look great!! spendthrift cap for me... the vince one looks lovely! This might be the first time I actually prefer the more expensive one, only because I love that lovely thick cable detail down the middle. Just wish it didn't have those side vents. I'd take either though! Wonderful find as always! Cute cute! I love this look! My favorite is the Gap sweater. I love the Gap sweater esp over a full midlength skirt! I might get it in a smaller size for a close fit! Great find! Really like the GAP sweater. I've been really happy with their last few seasons after what seemed like an endless line of misses! I love knitted sweaters. They're so warm! I'm a huge fan of GAP, so I'm definitely picking that one. Somehow I like the Gap sweater more than Vince. I love the Gap one! What a darling piece. Gap. I've always loved boatneck necklines. I'll stick with vince on the right. It is very nice, and you have chosen with great taste! I'm loving the Gap sweater. But I would bet that the Vince sweater feels better! I'm going to have to vote for the Gap sweater this time! I like the more oversized feel of it, and it looks much more comfortable! I absolutely love the Vince one. I love how the sweater has the 2 'openings' at the end at as opposed to the classic Gap cut. The Gap one says 'winter' like nothing else. I love chunky knits. I'm loving the Gap sweater! That Gap sweater is lovely! I actually like the hem of it a bit more. Wow I really like the one from the GAP. You are so good at this, too bad Vogue won't give you an article like this every month. I think the readers would be in shock. i actually was gifted with a similar sweater - such a cute look! Regardless of the price, I actually prefer the Gap one, because it's more slouchy and doesn't look as stiff. THAT SWEATEEERRR IS GORGEEOUUSSS DEAR ! Ooooo I love them both, so I will go with the cheaper! Great find Love!! i love everything about the Vince version, except the price, of course. I love the shape and design of the Gap one more - nice find! What a wonderfully classic cableknit! they both are cool! like the concept of your blog! !